I had high hopes for The Name of the Star. It was one of those books I was ridiculously excited about from the moment I saw it, mostly because I have a bizarre fascination with Jack the Ripper. I couldn’t wait to get my hands on it, but when I finally did, I was slightly disappointed. Not like ‘Nooooooo, whyyyyyyyy? !’ disappointed - the book was good, and I liked the unique concept, but it wasn’t as good as I’d hoped. I went into The Madness Underneath with no expectations. I was curious what would happen to Rory and the squad next, but I didn’t have high hopes like I did when reading the first book…and that’s a good thing, because this book was very meh for me. It started out well. The initial scene was wonderfully creepy and intriguing, but after that it took forever for anything else to happen. The story had moments of excitement that basically went nowhere and were kind of pointless. Not much happened in the entire book, and when something did happen, it was kind of random, and again, didn’t lead anywhere. It felt like a bunch of things thrown together and tied loosely, but not much actual plot. I wasn’t able to get interested or invested until toward the end, but when I finally got emotionally invested it was because something drastic and awful happened (which I’ll get to in a minute). As with the first book, I liked Rory for the most part. She had a great voice. She’s funny and kooky, and while some people might not appreciate the almost ‘stream of consciousness’ feel to her thoughts, I found it all believable, plus amusing. There was quite a lot of angst in this book, which was mostly understandable, considering a) Rory went through hell in the first book, and b) she’s a teenager. She was impulsive, self-centred, and made some horrendous mistakes, but it was mostly believable. I keep saying ‘mostly’ and that’s because there were some things she did that seemed really weird and out of character, and went beyond impulsive and into ‘what the hell is wrong with you?’ territory. There wasn’t much development or growth on her part, and the book was basically The Rory Show - all about her and very little about the other characters. In the first book I loved the secondary characters, but with the exception of learning a bit more about Stephen, the secondary characters seemed to just sort of…be there. Then there was the ending. *sigh* An ending like that should make me absolutely itch to get my hands on the next book, but it doesn’t. I was upset (half sad, half pissed), but it was almost a ‘too little, too late’ situation for me. It took so long for anything interesting to happen, and then when it did it was like a simultaneous punch to the gut and slap to the face. I’ll read the third book, but I’m not dying to get my hands on it like I feel I should be after an ending that dramatic. Overall, The Madness Underneath was just okay for me. I still like the setting (*goes all heart-eyes over London*) and the unique concept of the ghost police, and it had a few creeptastic moments, but that didn’t make up for the lack of plot or character development, or how the secondary characters, who were wonderfully vivid in the first book, seemed to get shoved aside in this book. Have you read The Name of the Star or The Madness Underneath? What did you think? If you haven't read them, do you plan to? Do you have a favourite story or series about ghosts? Let's talk here or on Twitter! 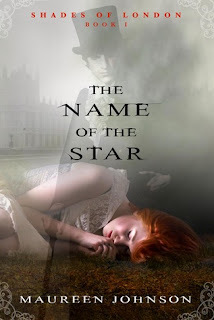 Everyone raved about The Name of the Star and I think I ended up buying it, though I haven't read it yet. I never heard anyone talk about this one, though. Maybe because it wasn't that impressive. One of these days I'll read the first book in the series. Hopefully, since my expectations are low, I'll like it. Haha, good thinking going in with low expectations! I wish mine hadn't been so high and maybe I would have enjoyed it more.